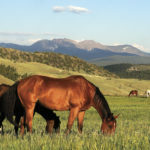 Freeze branding is commonplace in certain parts of the horse industry including disciplines like Cutting, Reining, Versatility Ranch Horse, as well as large ranches. It functions as identification of where a horse may have come from and if they are lost or stolen. Breeders often chose to brand the offspring that they produce as a way to keep track of and promote their programs. Some larger ranches use certain brands to identify the year, sire and dam of offspring. Brands can be passed down through the generations or created new. Knowing some of the performance industry brands, it is easy to recognize where horses at shows came from and perhaps what their bloodlines might be by recognizing brands by the Babcock Ranch, Bob Loomis, Tejon Ranch, Mike Major, Pieper Ranch and Kyle Ranch. Freeze branding is of course used with Mustang identification on their neck. It also gives your horse a way to be tracked back to you in the case of a fire, theft, escape or whatever. 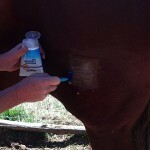 Branding is known to sometimes deter livestock theft. Horse rescues sometimes use them as a way to identify where the horse came from, so that they may be returned if they end up going the wrong direction. Auction houses are often required to determine where a brand came from before they can sell a horse. 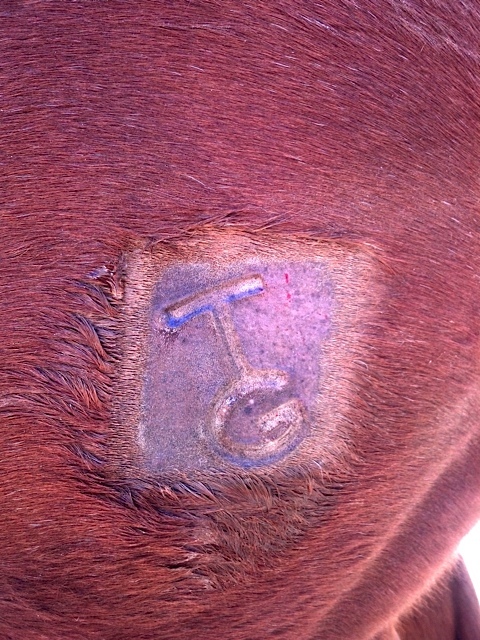 Of course it also gives the brand inspector an easy marking to identify the horse with. Compared to hot branding, freeze branding leaves a nice white hair brand and it is relatively painless, akin to freezing off a wart. When we were living in the Whitesboro, Texas area, we decided to start branding our broodmares and their offspring as a way to identify them and to promote our stock and farm. Over the years, we also like the extra identification it gives them. We originally chose our brand design because our place in Texas was called Tall Grass Farm. 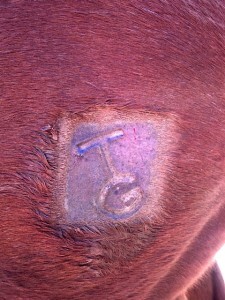 In these pictures, we were branding our 2 year old Quarter Horse filly, Ruby. If you are interested in freeze branding, start by deciding on your brand design. You can be as artsy or simple as you like. Just be sure that it is not so complicated or busy that it will be hard to figure out what it is once it is a finished brand. Check with the state to make sure the brand is available. 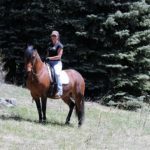 Before you register the brand, you will also need to decide where it will go on all of the horses that you brand – most common: hip, shoulder, neck. Next, register the brand with the state and have the brand made. We put our brand on the left hip, a little below center. You have all of your supplies and today is the day! You will need to get a little sedation from your veterinarian. 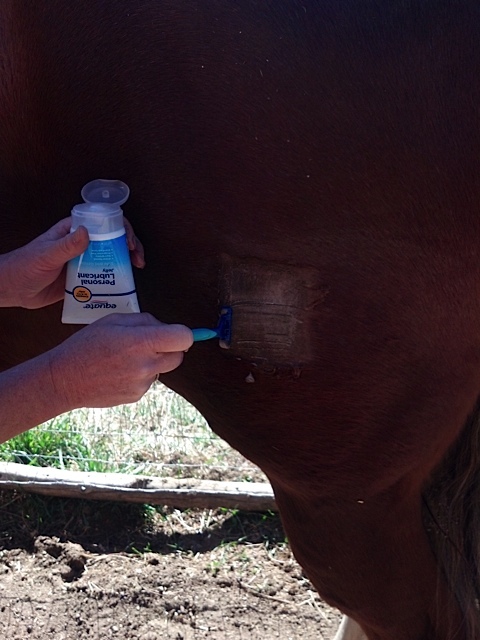 It helps to keep your horse still and steady for the amount of time they need to stand during the actual branding. NOTE: For your first branding, we would recommend that you have someone that is experienced help you, which could be your veterinarian. Too much contact time will kill the hair and color follicle leaving a hairless scar brand similar to a hot brand. Too little time will cause an undefined brand with some white and some colored hair. You are looking to only kill the color follicle, so that when you are finished you have a crisp, white hair brand. Supplies: Brand (brass head holds the cold best), 99% Isopropyl Alcohol (from your veterinarian), dry ice, small cooler, clippers with a #40 blade, razor, lubricating jelly (water based), timer, sedation. You can use liquid nitrogen instead of dry ice and 99% Isopropyl Alcohol, but the later may be easier to find. Brand is not bubbling anymore. Extreme Cold for the Freeze: We have always used 99% Isopropyl Alcohol and Dry Ice. The alcohol needs to be ordered from your veterinarian because 99% is a hazardous material. 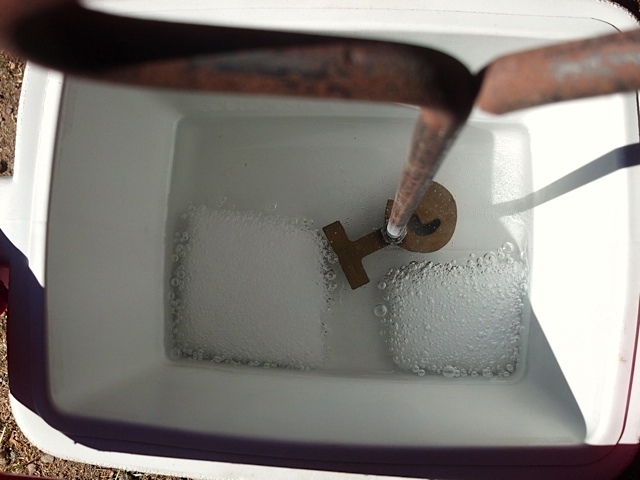 In the small cooler, place the dry ice (for our one brand, a 6 X 6 X 1″ block was sufficient). Pour in about a quart of the alcohol and place the brand in the bubbling liquid. The brand should be covered completely and is cold enough when the brand itself stops bubbling. Over time, frost will start to creep up the brand stem as well. 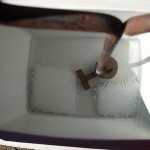 The dry ice will continue to bubble in the liquid. Prepping the Brand Site: If you have a #40 blade for your clippers, that is ideal or if you have the typical#10 blade like we do, just finish the site with a razor blade. 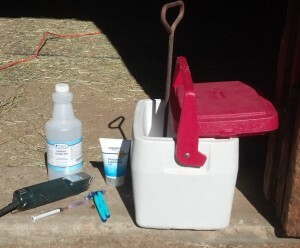 We carefully clip the area before sedating the horse in a neat, square box that is level. Making sure your box is level will give you a frame of reference when you go to put the brand in place. Once clipped, we use a water based lubricating jelly like KY to give a close shave. In the end, you want bare skin that is oil free. Branding: When you have your site clipped and the brand chilled, give your horse the sedation and leave him or her alone for 5 minutes to allow the sedation to kick in. Depending on the horse, you may want someone to hold the head. We tied Ruby fairly short and Andrew helped me keep her standing on both back legs by controlling her tail. 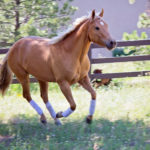 Often with sedation, the horse is relaxed enough to want to rest one leg or the pressure of the brand will also move them away. Therefore, always have someone hold the tail on the same side as the brander to keep a steady side pull in order to keep weight on the leg and the horse stable. Have the timer ready, get the brand and smoothly align it in position and then place it firmly in position for the required time. Enough pressure to keep it in place with solid, steady contact, but not too much. The final picture below shows the site after the brand is removed. The branding time we have used at our elevation of about 8000 feet above sea level is 26 seconds. In the paper at the bottom of this article indicates different times. The first time we branded in Colorado, we asked around to see what time people used in our area. In a couple weeks the branded layer of skin will start to come off. By two months, the white hair will be starting to grow in. Feel free to email us if you have any questions! Heather McWilliams © 2013.